A painter, creator of drawings for engravings, and an engraver himself, the activity of Galimberti is linked, starting from 1778, with that of Giovanni Maria de Pian, an engraver from Belluno. In 1785 the two artists worked together to create the nine engraved plates reproducing the pictorial cycle of Carpaccio for the Scuola di S. Orsola. Thei also took part in the publishing of the Fasti Veneziani, published in Venice in 1796-97. In May 1797 both Galimberti and De Pian joined the cause of the democratic government that governed the city until October, when, with the Treaty of Campoformio, the independence of the Republic ended. During these months Galimberti and De Pian collaborated in the realization of a series of aquatints, depicting the Piombi and the Pozzi of Venice. 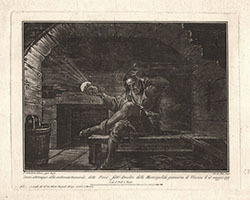 An indictment against the cruel prison regime of the past Venetian government, this series uses the aquatint technique in a highly dramatic way. After the Treaty of Campoformio, Galimberti and De Pian moved to Vienna, where they continued to collaborate until the latter's death in 1800.